Brian Faw nearly pitched a no-hitter for Greensboro in this May 1991 game. A single up the middle in the fourth proved the only hit he'd give up, according to The Greensboro News & Record. Faw, though, was fine with the outcome, he told The News & Record afterward. "The only other time I've pitched a no-hitter was in high school," Faw told The News & Record. "I had it on my mind, but I'm just as happy with a one-hitter, especially since it came in pro ball." Faw's pro ball near-no-hitter came in his second professional season. He went on to see three more. He never saw AAA. Faw's career began in 1990, taken by the Yankees in the 17th round of the draft out of Clemson University. Faw signed with the Yankees on their third attempt at getting him. They drafted him twice before, in 1987 and 1988, but he didn't sign. After his first selection in 1987, Faw told The Atlanta Journal-Constitution that he'd go to college if the money wasn't enough. But he was still happy to be taken by the Yankees. "I was glad they drafted me," Faw told The Journal-Constitution. "It shows that they're interested in me and that I've been doing well It's nice to know that all the hard work pays off." 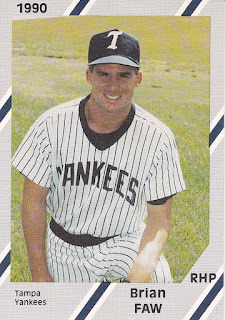 When he eventually did sign in 1990, Faw played his first year between the rookie Gulf Coast League and short-season Oneonta. He started 12 games in the GCL and pitched in one at Oneonta. Overall, he went 7-5, with a 2.38 ERA. He moved to single-A Greensboro for 1991, where he went 11-7, with a 2.13 ERA. He took some time out in August to meet with some day campers. Faw played 1993 with single-A Fort Lauderdale, then 1993 with AA Albany-Colonie. He went 9-5 in mostly relief work there, with a 5.23 ERA. He returned to Albany-Colonie for one more season in 1994. He went 4-6, with a 5.62 ERA to end his career.